* 3 hour session (a group Feldenkrais lesson or 2 with some instrument work/or an in- depth introduction to Feldenkrais for musicians work). 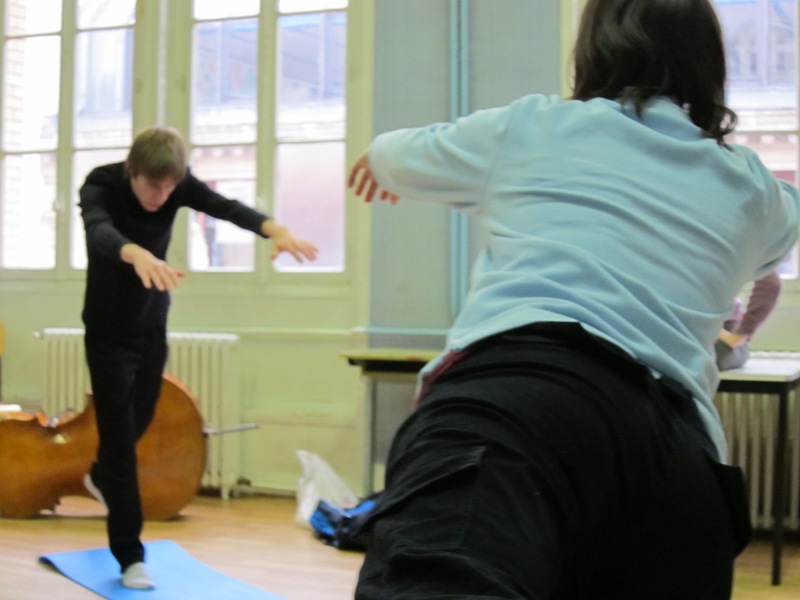 * 6 hour one day workshop (several Feldenkrais lessons, work with instruments, in-depth exploration of a specific theme). This work goes very much against the grain of a society that rushes everything, looks for results while ignoring the process, and puts using one’s will over listening and awareness. This is why a one day workshop (6 hours) allows the time to really go into depth, take the time to leave behind our preconceived ideas, to have the time to ask all the questions that come up and begin to try new, non-habitual ways of doing things. This also seems an effective way for busy professional musicians – intense one or two day sessions from time to time can sometimes be easier to schedule than weekly classes, and maybe more appropriate too – an intense day with weeks to integrate and experiment on one’s own works very well with musicians who are independent and often very fast learners. The workshops are generally organized around a theme such as “Finding More Comfort in Sitting”, “Stage Presence”, “What Can We Learn from Performance Anxiety”, “Being Anchored with a Sense of Lightness”. Students are often asked to come with their instruments and to play several times during the workshop so that they can feel their own development and also to help make the connection between the movement work and their playing. It is also very important for the student to have the feedback from the teacher to help guide the new sensations for the student and help clarify. The Feldenkrais lessons themselves usually last from 45 minutes to an hour, but Colin also teaches “mini-lessons” which he introduced into the workshops in order to give participants short lessons which were simple to remember and repeat later on. There are sometimes “exercises” with the instruments inspired by the principles of Feldenkrais’ lessons and aimed at making this work directly useful and clearly related to the musician’s work. Short discussions and times of exchange are extremely important too, because it is rare in the music world for musicians to be able to exchange on subjects such as concert preparation, or performance anxiety and have the occasion to learn from each other. It is also very important that the students leave the workshop not only with a series of new sensations and experiences, but also a minimum of intellectual understanding regarding the workshop’s theme. The utmost attention is given to creating an atmosphere where everyone feels safe and supported so that students can really work on their most important questions and not be afraid or feel on the defense – because it is when when one allows oneself to be vulnerable and to “make mistakes” that one is often the most open to learning and growing. Colin tries to approach each musician’s playing with respect and honesty, never wanting to force a theory on anyone and always aware of how difficult it is to play in front of colleagues.